This gothic chapel was built in 1875. It had a school below the chapel and a manse next door for the minister and a school house for the teacher. The memorial stone was laid by Thomas Barnes of the Quinta, a noted benefactor of nonconformist chapels. The total cost of all the buildings was £3000. It had its own burial ground attached. The chapel closed about 1985 and is now a private house. Congregationalists met in houses at Nantmawr from 1818 until they built a chapel named "Smyrna", on the opposite side of the road to the chapel in the photograph. 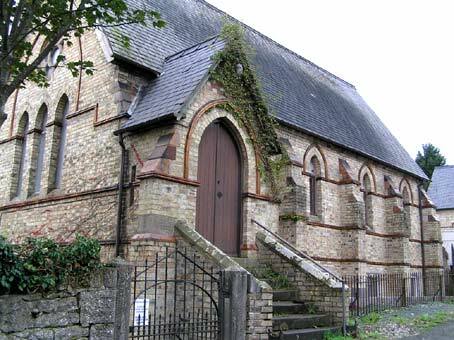 The chapel was built in 1830-1 and opened on 9th June 1831. In time the building became too small for the congregation, so a new chapel was built (in the photograph). Photograph © John Dixon 2006.